Green Mountain College received a A-. Washington Monthly's ranking of 171 out of 246 of Liberal Arts Colleges - Overall Rank was a major contributor to this grade. "Green Mountain College is an "environmental liberal arts college with an international focus." Green Mountain College educates about 800 mostly traditional students near the heart of Vermont's ski country in scenic Poultney. The school's orientation includes the "Wilderness Challenge," four days of intensive outdoor experience." What are the top 3 reasons someone should attend Green Mountain College? What is a typical Green Mountain College student like? Describe the type of person that should attend Green Mountain College. Standardized test scores are optional. Don't miss the interview. Pay meticulous attention to the essay. 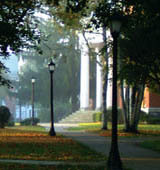 Green Mountain College was founded in 1834 by the Troy Conference of the United Methodist Church. Throughout its history, strong teacher-student relationships have been the hallmark of a GMC education, a tradition that continues today. At the heart of the College's environmental mission is the 37-credit Environmental Liberal Arts General Education Program, which all GMC students complete. ELA combines the skills and content of a strong liberal arts course of study with a focus on the environment. Experiential learning is also central to a GMC education: Students are encouraged to gain hands-on experience through internships, service-learning opportunities and study abroad programs. Interdisciplinary block courses allow students to spend an entire semester working with professors from multiple disciplines on a single area of focus, often through field research, overnight outings, discussions with experts and a culminating project. Adventure programming and the Farm and Food Project provide additional hands-on learning opportunities. What are the top 3 things that students do for fun at Green Mountain College? People at Green Mountain College Ski at local ski resorts; Killington and Pico. During the summer, fall, and spring months, students hang out by the river behind campus. Students also attend campus funded concerts. Campus housing is available for undergraduates. Housing deposit : $400.00. Housing deposit is not refunded if student does not enroll.. Freshman allowed to have car. No pets. 97% of freshman live on-campus. A program that prepares individuals to design public and private spaces, indoor and outdoor, for leisure, recreational, commercial, and living purposes, and for professional practice as environmental designers and architects. Includes instruction in the design and planning of public and private open spaces and their relationship to buildings and other aspects of the built environment; facilities management; related aspects of interior design and architecture, landscape architecture, and urban planning; and professional responsibilities and standards. Any instructional program in fine arts and art studies not listed above. A program that focuses on the principles underlying recreational and leisure activities, and the practices involved in providing indoor and outdoor recreational facilities and services for the general public. Any instructional program in natural resources management and policy not listed above. The average student pays $20,722 for tuition, fees, and other expenses, after grants and scholarships. Total stated tuition is $31,072, in-state and on-campus, before financial aid. Learn more about financial aid at http://www.greenmtn.edu/admissions.aspx. Estimate the net price for you at http://npc.collegeboard.org/student/app/greenmtn. 31% of students graduated on time. 70% of full time students continued studying at this school after freshman year. Green Mountain College participates in the NCAA Division III for college athletics. Want more info about Green Mountain College? Get free advice from education experts and Noodle community members.